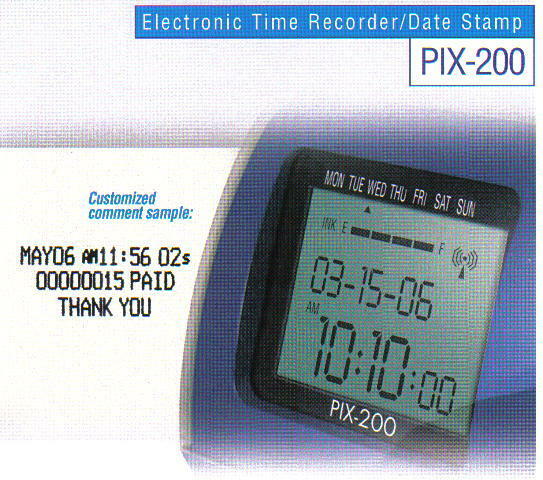 The PIX-200 ia an all-in-one electronic time recorder and date stamp designed to meet the typical needs and special requirements of contemporary business. The PIX-200 includes a wide variety of standard features and offers a set of optional accessories with unique functions. The clock is great for use in applications from simple time and attendance tracking to more sophisticated computer communication and time synchronization. 31 selectable preset imprint formats: Prints year (2 or 4 digit), month, ady, hour (AM/PM or 00-23), Minutes (regular, tenths, hundreths), seconds, 8-digit number and comments.